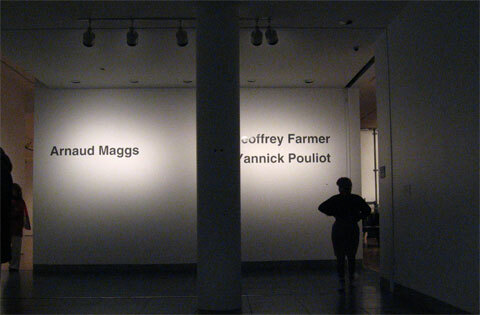 Geoffrey Farmer, Yannick Pouliot and Arnaud Maggs exhibit in Montreal's Museum of contemporary art. Vancouver artist Geoffrey Farmer has a show at Montreal's Museum of contemporary art. Geoffrey's work is mostly installation-based. I like the art piece 'Notes for Strangers' (1990), for which he wrote letters about strangers he met on a bus trip using his miniature typewriter. These letters can be considered as poems signed by 'A Stranger'. Yannick Pouliot, a young artist from Quebec, shows modified royal furniture. Montreal-born Arnaud Maggs, a former graphic designer and professional commercial photographer, decided at some point in his life to become an artist. He is an important Canadian conceptual photographer. The exhibited work shows some of his photography work that consists in archival photography. The museum has a the Mediatheque, a place to do research in contemporary art.